Last week, I decided to buy a new web domain with my remaining web cash. I always thought that it would be nice to have a short domain name which will be easy to remember to use as a URL Shortener. Something like cedric.com came into my mind but eventually it was already registered. So I thought what would happen if I buy cédric.com with the accentuated “é”. Without doing any prior research and being elated by the idea of a brand new domain name, I headed to GoDaddy and found that cédric.com was indeed available. This is was totally unanticipated and it didn’t appear nice at all. Not cool enough to be used as a URL Shortener. I decided to search upon it only then and unveiled the mystery. 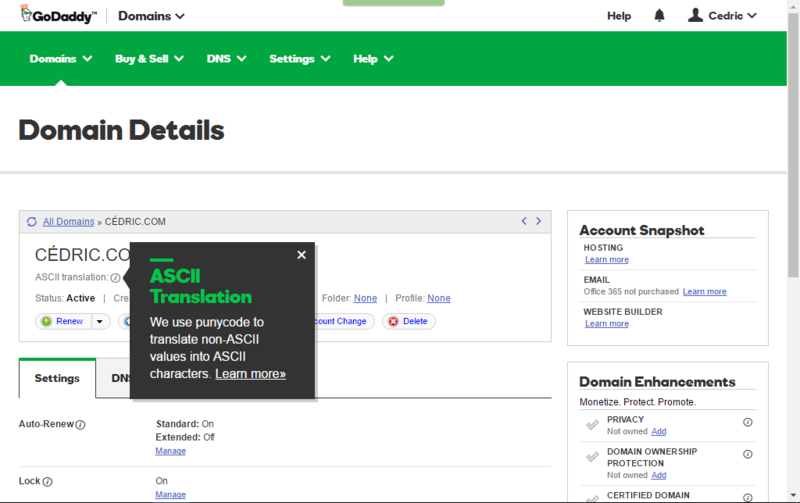 Web domain names are encoded using ASCII which is a limited set of characters that does not include accents or non-alphabetical characters unlike Unicode. So moral of the story, never, I repeat never try to buy domain names with non-ASCII characters unless you want one of these bizarre, odd and abnormal domain names.